Watch SpaceX employees and Elon Musk as they watch a booster land. What Happens When the Camera Faces the Other Way During a SpaceX Landing? In this long exposure, you can see the Falcon 9 rocket taking off (bright streak), the short booster re-entry burn (top center) and the landing burn (lower right) on the first successful landing attempt. 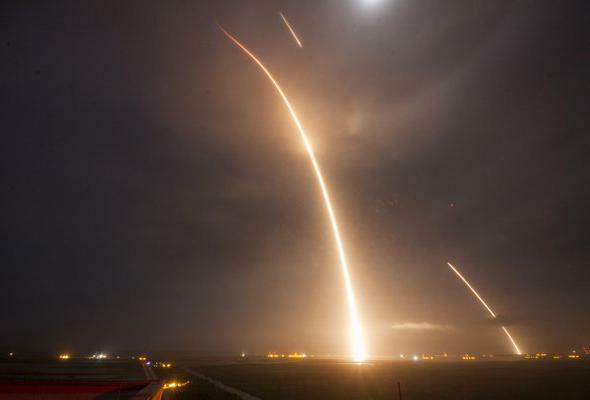 One year ago today, SpaceX landed the first-stage booster from a Falcon 9 rocket that boosted a payload into orbit. Since that day, the rocket company has repeated that feat five times. Designed as a way to save money by not having to rebuild the first stage for every launch, the booster landings also make for incredibly dramatic video. In the live broadcasts we’ve seen (and heard) the SpaceX team cheering as each milestone in the launch is reached, but they’ve only made brief appearances. What happens when the camera is turned around, so that we focus on them instead, as well as on SpaceX CEO Elon Musk, as they watch that very first landing live? The footage was taken for the National Geographic Channel’s series Mars, a mix of fact and fiction about the first humans to reach Mars. (Full disclosure: I haven’t seen it yet.) I quite enjoyed this clip. I’ve been to the SpaceX factory a couple of times and it’s an amazing place; a little like Willy Wonka’s chocolate factory except they make rockets there. What really struck me is how enthusiastic and dedicated the people who work there are. They are fiercely devoted to the SpaceX vision, and just as proud of what they do. The intense emotion you see from them in this clip is completely genuine and reflects how they feel watching their handiwork —literally, since much of the rocket is built by hand— blast its way into space… and as one part of it comes back down. It’s engaging to see the mix of emotions, the worry/dread/joy/pride, Musk goes through as well. The way he is commonly depicted in the media is more of a comic book character than human, and while he is in many ways larger than life, when he watches that rocket goes up he is a little kid just like the rest of us. Though, perhaps, a wee bit more invested in the outcome. I went through some engaging emotions myself watching that. It really brings home that this is a human endeavor, this exploration of space. And don’t forget that this exact same personal sort of scene goes on in at Blue Origin, at ULA, at Orbital ATK, at the ESA, in China, India, and everywhere humans build rockets to ply the sky. I need not defend here our desire and our need to wander out into the universe; I’ve done so elsewhere. But I want to just remind you of what happens when we do. We become the best of who we are. Tip of the nose cone to my dear friend Katherine Nelson, who’s watched a launch or two herself.